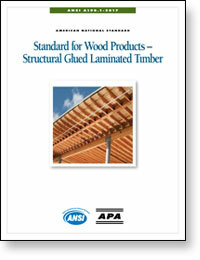 Download ANSI A190.1-2017 Standard for Wood Products — Structural Glued Laminated Timber. provides material suppliers, producers, distributors and users with a basis for common understanding of the characteristics of this product. Click on the title to download document below.